Gandermonium: Joseph & Moses. You couldn't make it up. Could you? For those that witnessed both games, you may have seen some unfamiliar faces donning the amber and chocolate shirts. So with the news going round the town like a whirlwind, I guess it only right we bring you a little update on the two new lads. So here’s a brief over view to get your teeth into.Without further adjeu, Moses & Ben. Schooled at The Archbishop Lanfranc School, Croydon, Swaibu joined the Crystal Palace academy at the age of 16 having been spotted playing for Croydon Schools and never having been previously associated with a professional club. Impressive progress in the academy saw him offered a professional contract at the culmination of his two-year scholarship and awarded the Scholar of the Year and Vice-Presidents Young Player of the Year for the 2006–07 season, whilst at Crystal Palace. Lincoln City, Kettering Town, and most recently, Bromley where he finished the the 2012-13 season. 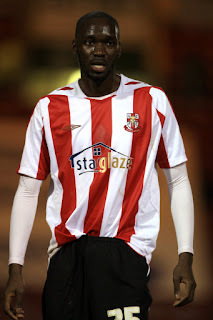 Ebenezer Joseph Tettley "Ben" Kudjodji (born 23 April 1989) is an English footballer who plays as a striker and hails from Ghana! 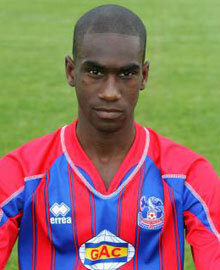 Kudjodji was a graduate of the Crystal Palace academy. He made one appearance for the Eagles in their 2–0 victory over Barnsley in the Championship on 15 March 2008, replacing Clinton Morrison as a substitute in the 89th minute.Crystal Palace manager Neil Warnock described Kudjodji as "a smashing lad and deserved his opportunity in the team, but he couldn’t sustain the level that saw earn his debut. "He was released from Crystal Palace in May 2008, along with Mark Kennedy and Moses Swaibu. Crystal Palace, Bronley, and Croydon Athletic. In other more recent news, there was some sad news circulating the world of all things Amber. The sad news of course, that Harry Beauts, was on his way to BIGGER things, pastures new, a new adventure in the footballing world. A young man hungry for success in the Football League. 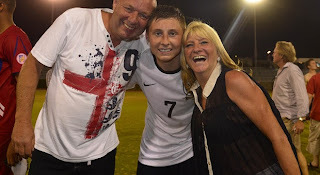 Well with Harry gone, and going on trial for a few clubs, and playing in a few Pre-Season games, for a couple of clubs, it wasn’t to be for H...just yet! Harry knew in his heart of hearts where he belonged for a further year/season, and that’s back with us. So all you BIG boys in the bigger leagues will just have to wait to another year to get your claws in to Mr Beautyman, as he’s staying with us for another season. With our coaching staffs years of experience, and knowledge, between them, Harry will continue to develop, and prosper into a player suited to league football. It's unlike me not to throw in a video, of sorts. So here we've got some Ali Fuseni action. Found this little gem on youtube...keep you occupied for a minute or two, or even three! Normal service will be resumed come Saturday. Thank you Mr OohAah !